This cranberry bread is a sweet and tender quick bread loaded with fresh cranberries and topped with a tangy orange glaze. Cranberry bread is perfect for dessert, an after school snack, or served with a cup of tea. I love a good quick bread – pumpkin chocolate chip bread and blueberry banana bread are some of our all time favorites. This sweet and tart cranberry bread is the perfect treat during the winter months when fresh cranberries are in season! When cranberries are widely available at the store, I try to cook with them as much as possible. Once they’re gone for the season, you have to wait a whole year to get them again! 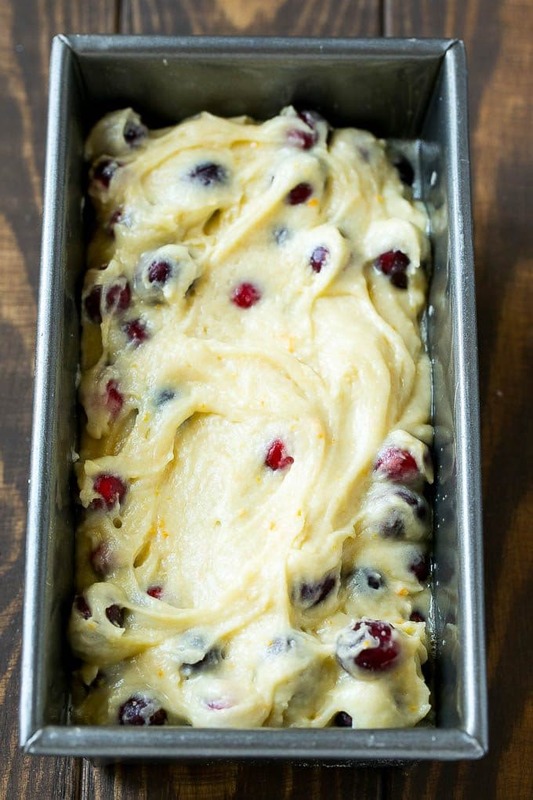 This cranberry bread is a super moist loaf with plenty of cranberry flavor and a hint of orange. It’s quick to make and totally delicious. How do you make cranberry bread? This bread is a one bowl recipe made with sugar, flour, egg, cranberries, buttermilk and orange zest. The dry ingredients go into the bowl first, followed by the wet ingredients. The final step is to fold in fresh cranberries. I give the cranberries a light coating of flour before I add them to the batter so that they won’t sink to the bottom of the loaf. After the bread has baked and cooled, it’s time to add the glaze, which is simply powdered sugar mixed with orange juice. 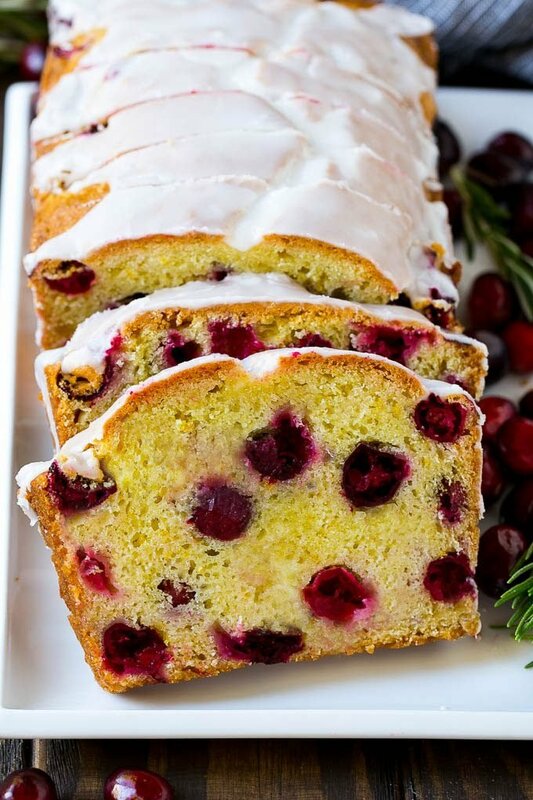 Add a generous amount of the glaze to your cranberry bread, then serve and enjoy. Can cranberry bread be made ahead of time? This bread will keep covered at room temperature for up to 3 days. I prefer to eat it on the first day when it’s freshly baked, but any leftover slices will still be delicious on day 2 and day 3. Can you freeze cranberry bread? Cranberry bread makes an excellent candidate for the freezer. If you’re planning to make your bread in advance and freeze it, I prefer to leave the glaze off, then add the glaze later on after the bread is thawed and ready to eat. You can absolutely use frozen cranberries for this recipe, although fresh is my preference because the frozen berries can be a bit water when thawed. While this bread is delicious as-is, you can add other ingredients to switch up the flavor profile. White Chocolate: Add 1/2 cup white chocolate chips to the batter. Ginger: Add 1/4 cup finely chopped crystallized ginger to the recipe. Lime: Swap out the orange zest for lime zest and use lime juice in the glaze. Coconut: Add 1/3 cup flaked coconut. Apple: Add 1 diced apple to the recipe. Dark Chocolate: Add 1/2 cup semisweet chocolate chunks to the batter. 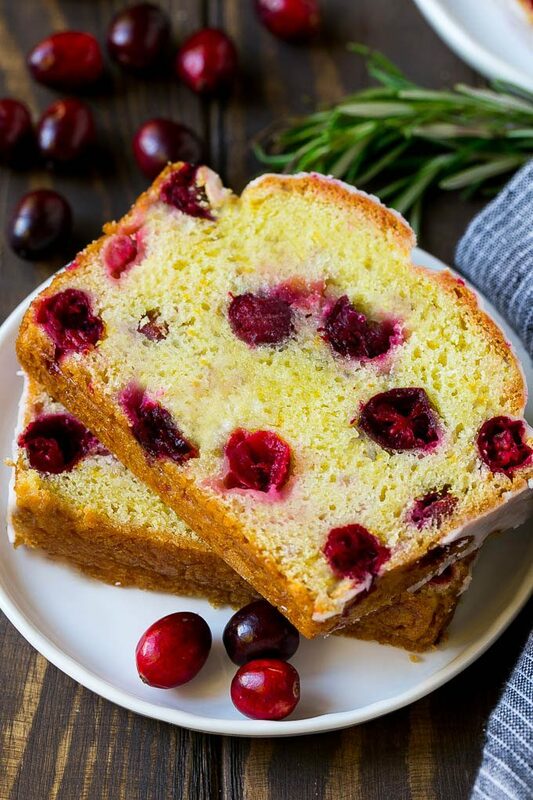 This bread is sure to be a hit with all the cranberry lovers in your life – you need to love that sweet-tart flavor combination to enjoy this one! Preheat the oven to 350 degrees F. Coat a 9" x 5" loaf pan with cooking spray. Place the flour, baking powder, baking soda and granulated sugar in a large bowl; whisk to combine. Add the butter, egg, buttermilk and vanilla to the dry ingredients. Stir until just combined. 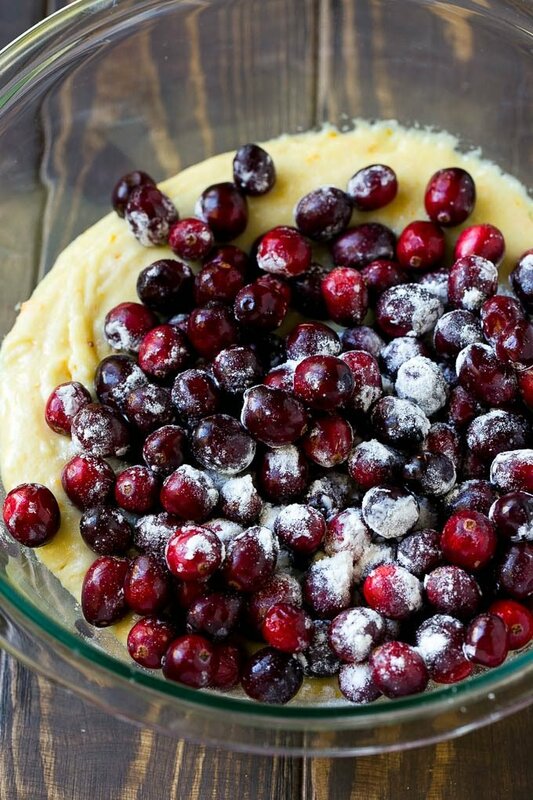 Toss the cranberries with 1 tablespoon of flour. Add the cranberries and orange zest to the batter and gently stir until just mixed. Bake for 60 minutes or until a toothpick inserted into the center of the loaf comes out clean or with just a few crumbs attached. Run a thin knife along the edges of the pan to loosen the bread. Let the bread cool for 10 minutes, then carefully invert onto a cooling rack. Let cool completely. After the bread is cool, make the glaze. Place the powdered sugar and orange juice in a bowl and stir until smooth. Drizzle the glaze over the bread. Let the glaze set, then slice and serve. We loved it! Have you ever made it into muffins? How many will it yield and long would you bake them? It should yield about 12 muffins and I’d try baking for about 15-20 minutes! I am waiting for the weekend. I already printed this recipe and I am going to make this on weekend. 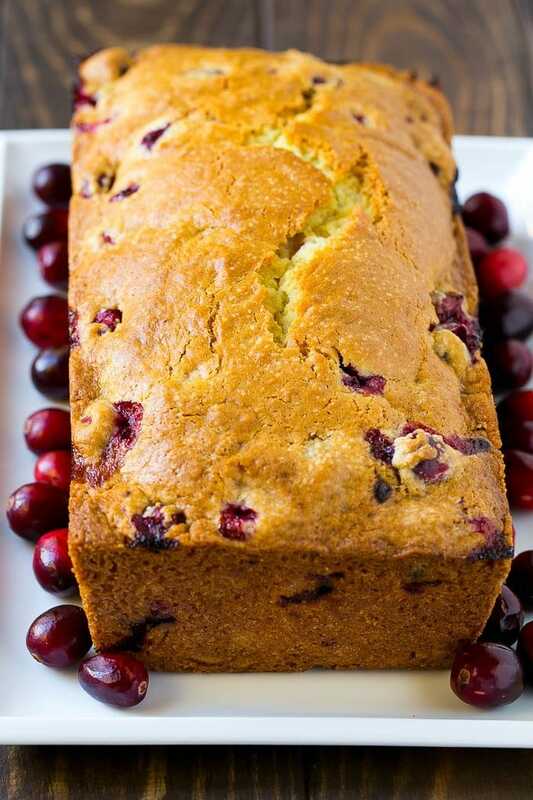 Thanks for sharing the recipe for Cranberry bread. 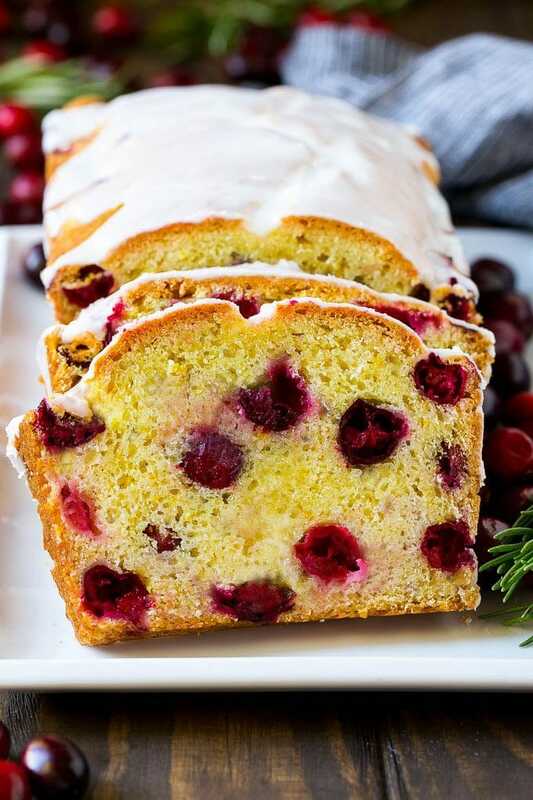 This cranberry bread looks delicious! I love that it’s topped with a glaze. Thank you for sharing the recipe. This looks so delicious and perfect for the fall season! Definitely adding this to my Thanksgiving meal lineup! This recipe looks so tasty- I can’t wait to try it for our upcoming family breakfast! Your cranberry bread is beautiful! It looks delicious and so pretty too. Perfect for the holidays or just for a nice fall or wintertime dessert. How yummy this bread looks like. 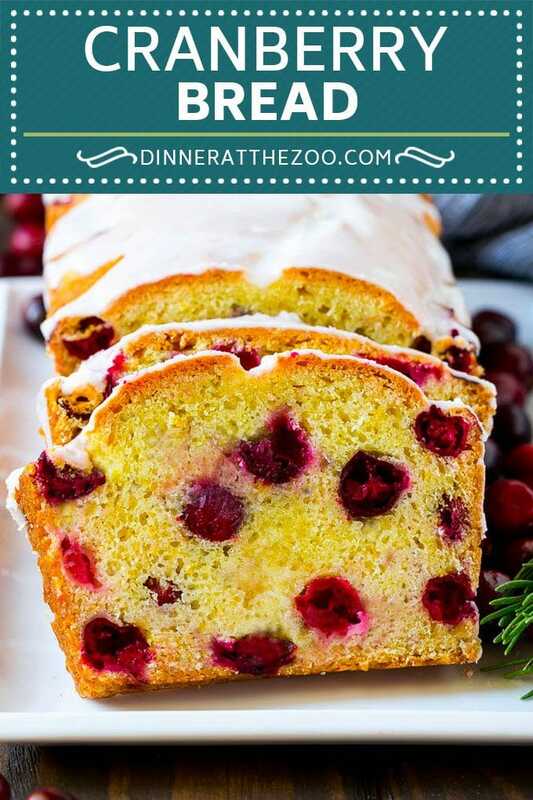 I absolutely love its color and the look of cranberries in the bread. This looks every tantalizing and the topping is just so yummy. Would be just perfect for breakfast.